What are the benefits of hiring a professional pet sitter? Your pet will remain in his familiar, secure environment and he will maintain his normal routine. Pets that are boarded may be exposed to pathogens from other animals, may suffer from excessive noise and over-simulation, and will not receive extensive personalized care due to the high volume of animals at a boarding facility. At home, your pet will receive lots of attention, cuddles, and belly rubs. In addition to caring for your pets, Woof to Hoof Pet Services will also give your home a “lived-in” look by collecting your mail and newspaper, taking out and bringing in your trash and recycling bins, rotating lights and blinds, and other free home care services. If we discover a problem in your home (gas leak, burst pipe, broken window, etc. ), you will be notified immediately and we will work with you to remedy the problem. While some people choose to have a neighbor, friend, or family member stop in to care for their pets, we do this for a living! We will not forget a feeding, fail to notice a health problem due to inexperience, or feel burdened by being asked for a favor. How and why did you become a pet-sitter? I have been taking care of animals from an early age and began farm sitting locally in 2010 when my farrier asked me to care for her farm while she went on hiking vacations. She encouraged me to offer my services to more people, since Suffolk is such a rural area and there are many horse and farm owners who rarely take vacations or simply go out to dinner because they don’t have anyone who is willing and capable of caring for their animals. Sharon put the word out that I was a reliable, knowledgable, and conscientious caregiver for both large and small animals, and I began taking on more clients. On April 7th of 2011, my entire life changed. My brother, Lon, was in a very serious explosion accident and sustained 3rd degree burns to 96% of his body. He was not expected to live. My parents, myself, and Lon’s girlfriend all dropped everything to move to Richmond and keep constant vigil by Lon’s side. While we were all living in Richmond, my mother had arranged for a former student to stay at the house and take care of our horse, two dogs, and cat. For the first few months, it seemed that she was doing a good job, and we thought we had little choice but to trust in her care – we could not and would not leave Lon’s side. Later, when I began spending more time in Suffolk, it became apparent that the animals were not being cared for to an appropriate standard (she lost a cat and she didn’t notice or notify us that he was missing for several days or make any attempts to find him, contact local agencies, or otherwise facilitate his return.) I arranged for the “sitter” to vacate the house and we made other arrangements for our animals’ care. The experience of absolutely depending on someone else to care for my animals, and then finding that care to be lacking really gave me extra incentive to provide above-and-beyond farm and pet care to more people. I treat your animals as if they were my own, giving them personalized and attentive care – I don’t just throw down food and leave. If there is a problem with your pet, I notify you and we decide together how to address it. I try to leave your house and barn cleaner and neater than I found them, and I go the extra mile to make your animals and you feel as though you never left. 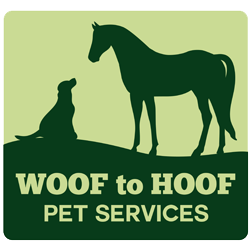 For more information about me and the formation of Woof to Hoof Pet Services, visit our About page. We have cared for: dogs, cats, horses/equids, cattle, hogs, pot-bellied pigs, chickens, turkeys, ducks, quail, llama, alpaca, fresh and salt water fish, reptiles, amphibians, parrots and other indoor birds, hamsters, guinea pigs, rabbits, mice, rats, and hermit crabs! If your animal is not in this list, please email us, as we would be glad to learn about and care for something new! What happens during a visit to my pet? Individual needs and visits may vary, but in general we: walk/play/cuddle with your pet, feed and provide fresh water, administer medications when needed, clean stalls, litter boxes, cages, and tanks when needed, and give your pets lots of love and attention. If you have horses or other farm animals, we will care for them per your instructions, and give sociable animals personalized attention as well. If you have booked vacation services or overnight care, we will also give your home a “lived-in” look by turning lights on/off, watering indoor/outdoor plants, bringing in your mail/newspaper, and taking trash/recycling to the curb and returning the cans to their normal storage location. Need something else? We customize pet and home care to your needs! Can you let me know how my pet is doing while I am gone? Yes! We can provide text and/or email updates, with or without pictures so that you can rest assured that your pets are happy and healthy each day. However, we like to let you enjoy your time away, so we will not bother you with day to day details unless you would prefer those notifications. Do you administer medications to pets? Yes. We are experienced with oral, injectable, and topical medications, and they will be administered per your instructions at no additional charge. If your animal needs extensive medication, wound care, or bandaging, we reserve the right to charge for extra time at our current hourly rate. If my pet has an “accident,” do you clean it up? Yes. During our Meet and Greet, we will ask you to show us where you keep your cleaning supplies, and if your pet has an accident we will treat the spot according to your specifications. If your pet frequently has accidents, we may suggest adding an additional visit during the day, or confining the pet to a non-carpeted area during times when the pet is home alone for extended periods. If we spend a great deal of time cleaning up after accidents, we reserve the right to charge for extra time at our current hourly rate. What will Woof to Hoof Pet Services do if my pet suffers an acute illness or is injured while I am away? If your pet becomes ill or is injured while you are away, we will notify you right away and work with you (or your emergency contact, if you are not available) to decide on the appropriate treatment plan. A Veterinary Release Form that authorizes us to initiate treatment for your pet is part of every contract. Time spent transporting your pet to the veterinarian, waiting for treatment, and transporting your pet home may be charged at our current hourly rate. Do you board dogs and cats in your home? No. Woof to Hoof generally provides in-home pet sitting only, as we do not have facilities for boarding and we also believe that pets are happier and healthier when they stay in their own home with their normal routine in place. We will discuss boarding pocket pets, reptiles, or fish in small tanks on a case-by-case basis. We primarily serve Suffolk, Virginia, but will consider neighboring counties/cities on a case-by-case basis. Our primary area codes of service are: 23434, 23432, 23437, 23438, 23487 and parts of 23430. We are happy to discuss serving you if you are outside our 10 mile primary service area, but in order to cover our costs and time commitments, we reserve the right to charge $1.50 or more per additional mile beyond the 10-mile radius for each trip. Please contact us and we will discuss your needs. What is the process for a becoming a new client? If you have a pet or farm sitting need, you may call or text Joanna at 757-618-9388, email her by clicking HERE, or fill out our contact questionaire HERE. Because she is out and about during the day, it is often easier and faster to text or email. It is our policy not to answer phone calls, texts, or emails while we are with our clients’ animals, so please be patient: we will contact you back! What do I need to provide at the initial consultation? Please be ready with 2 copies of all keys needed to access the house and/or property. If you have been emailed paperwork beforehand, please fill out all portions as you are able. If you are ready to book dates, a 50% deposit is due order to reserve dates for vacation pet sitting/overnight pet sitting. Payment is currently accepted as cash or check, checks made out to “Woof to Hoof Pet Services.” For new clients, a deposit of 50/100% may be due to secure the dates. The balance of payment is due on the first date of service. Do you offer discounts on long-term service? Longer term packages can be discussed on an individual basis. Your pet’s safety is our top priority. Woof to Hoof will make every effort to provide care in the event of bad weather, but in severe weather (thunderstorms, blizzards, heat waves, etc), we may modify the length of dog walks, turnout time, or outdoor time in general and instead spend the majority of our time inside with extra cuddling and mental stimulation. If we are sitting your farm, don’t worry, your animals will still get fed and cared for despite any severe weather our area may be experiencing. We have worked in hurricanes, thunderstorms, and snow, and we aren’t afraid to get wet or dirty in order to make sure your animals are warm, dry, and fed. Dog walking/Midday Pet Visits: Please give 24 hours notice to receive 100% credit towards future visits. If we do not receive a cancellation communication at least 24 hours in advance or arrive to find you at home but not in need of service, you will not receive a refund or credit. Vacation pet & farm sits: Please give 4 weeks notice to receive 100% of your deposit as a credit on your account towards future service. If we do not receive a cancellation communication at least 2 weeks before the first date of service of a booking, your deposit will not be refunded and you will not receive credit towards future services. Overnight pet & farm sits: Please give 4 weeks notice to receive 50% of your deposit as a credit on your account towards future service. If we do not receive a cancellation communication at least 2 weeks before the first date of service of a booking, you will forfeit your entire deposit. This is a premium service that can only be provided to one client at a time. Holidays: Please give 4 weeks notice to receive 50% of your deposit as a credit on your account towards future service. If we do not receive a cancellation communication at least 4 weeks before the first date of service of a booking, your entire deposit will be forfeited. Holidays: New Year’s Day, Memorial Day & Weekend, Independence Day, Labor Day & Weekend, Thanksgiving, Friday after Thanksgiving, December 20 – December 31. Late Departure/Early Return: We understand that plans change, flights are cancelled or delayed, and life happens! However, we are generally unable to rebook time slots cancelled with short notice. If you need to modify an existing reservation with less than one week’s notice, you may still be responsible for the visits you booked because we have set that time aside exclusively for your pets.